Natural antioxidant, full-spectrum Vitamin E with tocopherols and tocotrienols. $24.75 AutoShip What is AutoShip? TocoSpan® E is a powerful antioxidant, Vitamin E supplement, protecting cells against the effects of free radicals. The eight forms of vitamin E, four tocopherols (alpha, beta, gamma and delta) and four tocotrienols (alpha, beta, gamma and delta) all have varying functions and benefits. TocoSpan® E naturally combines these key ingredients in one balanced, superior Vitamin E supplement. Full spectrum TocoSpan® E is a complete, natural source of antioxidant with that work together to enhance overall health. Most other vitamin E supplements fall short because they simply contain one or two vitamin E sources, oftentimes synthetically. Only a full spectrum, natural (non-synthetic) vitamin E like TocoSpan® E can give you a potent and protective dose of powerful antioxidants. 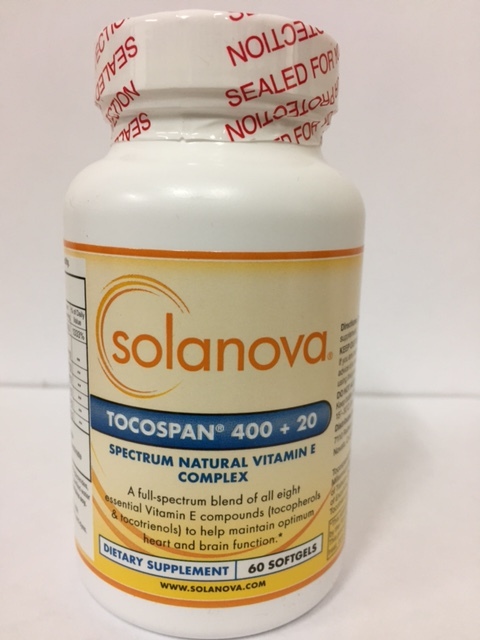 Other ingredients in Tocospan Vitamin E: Gelatin, medium chain triglycerides, glycerin, soy lecithin, high P.C., purified water and ascorbyl palmitate. Contains soy. Free Of: Starch, sugar, sodium, preservatives, yeast, corn, milk products, gluten and artificial colors flavors, and dyes. Suggested Use: Adults take one (1) softgel daily with or after a meal. A vitamin E with all the toco's like TocoSpan E is hard to find. I love it!” - Rick C.